This emphasises the impression we have of the novel’s characters living on the margins of society, regarded as old-fashioned and past any use, rather like the electronic equipment Mr Yeo repairs, or the bulbs sold at Omusa, no longer available anywhere else. Intimate moments between them involve discussing the whorls of hair on their heads, and singing songs together. They also spend a lot of time eating. Some readers may find this gentle progression frustrating but I felt the fear of commitment an accurate reflection of their uncertain futures. The threatened separation from shadows also suggests a lack, an emptiness; it’s no surprise that when they open a matryoshka (Russian) doll together, the innermost doll gets crushed. 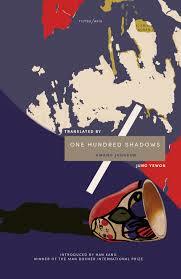 One Hundred Shadows proceeds like a dream, a strange combination of vivid naturalism and uncertain symbolism, and is all the better for it. You are currently browsing the archives for the Hwang Jungeun category.